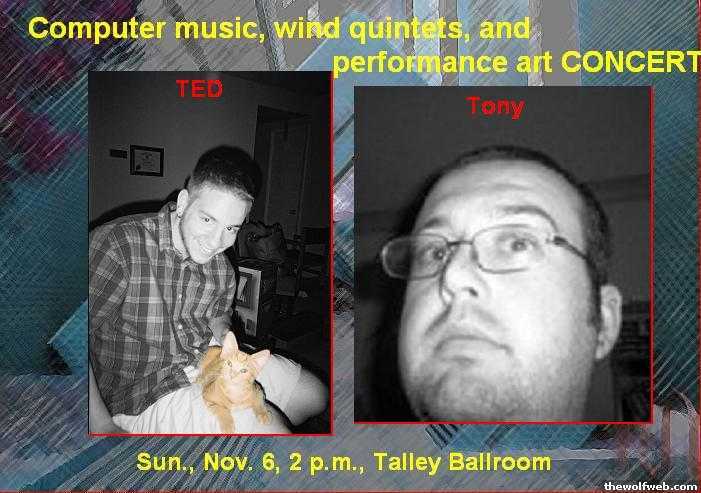 The music of Ted Gellar and Tony Sprinkle in concert. Wind quintets, computer music, and performance art, inspired by current social problems, classical literature, and liturgical texts. Social commentary, entertainment, and aesthetic pleasure. Plus a wild audio-visual performance art piece entitled "A Terrorist Survival Guide"! I would find a new poster designer. No offense, but its not very eye catching. Is Waschka still around State these days? I heard he was taking some time off. e) liturgical texts (make those collars extra fancy) . Tony Sprinkle + Liturgy = WHOA! NELLY (furtado) maybe?